Join us for a very fun way to use up your scraps! Please read this entire post! The blocks are the same as the last swap hosted by Sewbiz. 5 scrappies and 4 solid whites. No creams, no off whites. Sign ups require a commitment to communicate. You will be required to check in with your thread at least once a week, so we know you are still involved. Post your pics of blocks or anything else you are working on, reply to other’s pictures and comments, or chat a bit. The nice community in this group is dependent on all of you posting and sharing. Also, if I need to pm or email you, I expect you to respond in a timely manner, (not longer than 48 hours). Failure to do so may result in your being banned from future 9P swaps. Sign ups are open until January 31st.. Blocks must be here in my hands no later than Feb 21st. We are swapping sets of 10 blocks per bag, up to 10 bags. Each bag must contain 10 completely different blocks (no fabric repeats in a bag.) This shouldn't be a problem if you are using scraps. Each bag can contain the same set of fabrics, just no duplicates in any one bag. I need the bags ready to swap bag-for-bag. You will need quart size bags (not sandwich) to accommodate the size of the blocks. Please put your board name on each bag. Before mailing, put all your bags into a big gallon bag with your name and address clearly on the bag, along with your board name. Then ship in either a tyvek or padded flat rate envelope. No paper envelopes, as they don’t hold up. Be sure to include your return postage! The fees for the padded flat rate envelopes I will use for return U.S. shipping is going up to $8 as of the 31st of January so be sure to include the correct amount when you send your package to me. Do not send me stamps or stamped envelopes! Please use good fabric in your blocks… like you would hope to receive. 100% cotton, only. No thin fabrics. If you have to starch it to make it acceptable, don’t use it for this swap. Prewashed or not really doesn’t matter in pieces this size, so just use what you have. Your finished blocks must measure 6.5”. In a follow-up post I will tell you how to insure they do. Most people did great with this last time… let’s strive to get 6.5" blocks. If they come out smaller, it is your responsibility to adjust seams or remake them, to get them to 6.5". The center square should be 2" square. Sign up by pm’ing me your real name and address, and your email address. I will include my address when I confirm your PM to me. Last edited by PatriceJ; 01-17-2019 at 12:24 AM. I'm in. I sent you my info once. Would you like it again? CORRECTION It's 5 SCRAPPIES and 4 WHITES!!! Queenbarbie, No, not necessary. You're in too Cheesehead! as well as Wannabee!. I hope I've given enough time for everyone to finish on time. If I remember correctly the last swap there were quite a few of you that had the patches sent in waaaaay ahead of time . I ask that the envelopes not be sent out for at least another 10 days.. I will be in NC then and I don't want to overwhelm my neighbor that collects my mail when I'm not around..
Beside myself we now have 3 signups. Hi, I'm new to this swap. Looking forward to the fun. My guild group is making 9 patch blocks for a raffle quilt. I belong to the Birthday Swap so I have lots to choose from. Welcome Trish. I am also a newbie to this swap. I am looking forward to go through lots of my scarps and see what fabrics I had forgotten about. A Hint. I find that when I use a finer thread my blocks are more accurate.. The thread doesn't take up space.. The Coats and Clark thread is thicker than Guuterman and Aurifil even tho they are the same weight. I would also like to know the number of sets of 10 you will send before the signup date of January 31. Last edited by Honchey; 01-16-2019 at 08:21 AM. Honchey, I can do 10 sets of 10. I am interested but not sure what kind of white fabrics you need. Are you talking about solid white like kona cotton? Just please PM me. I would be a newbie also. 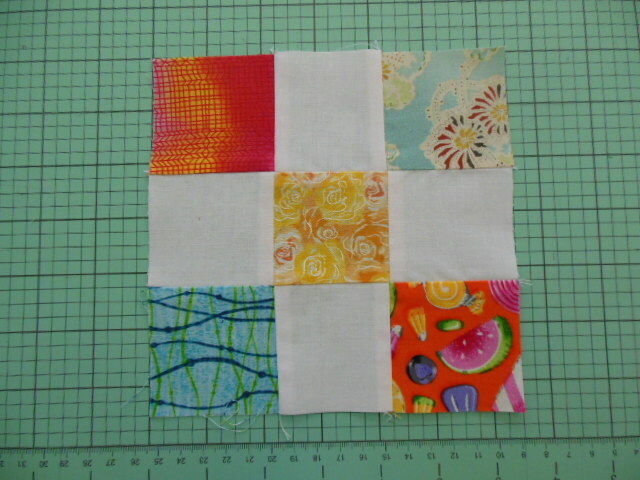 And--do I put different fabrics in one block or does each block need the same fabric with the white? Thanks for any info. Hi Trish b, I also did the Birthday Swap and I knew your name was familiar..
Jordan, I sent you a PM. This is a photo of the position of the squares for the scrappy 9 patch. I bought my Kona white last week. It's my go to white. I got my Kona cotton white and made one block yesterday and it didn't take long at all and so enjoyable. I cut several blocks 2 1/2" last night and hopefully will get to sew today sometime. This is so fun. So far I have 50 blocks done. I had bought a jelly roll awhile back. I opened it to use a few of the strips. Some of my stripes had a curve in them where the fabric was folded in half. Then I had some that seemed that they were cut on the bias. The bias ones I did not use for the swap blocks. I will use those for extra blocks for my quilt. Hopefully next weekend I will have all 100 blocks done. For only one 2 1/2" in a 6" block, it seems fine to use the bias cut strips. After all, if it's a scrappy situation, often to get a square cut out of a small scrap you cannot be choosy about the direction of the grain. I plan on doing 3 bags with 10 blocks in each bag. If I get more done do you want me to let you know or do you just want me to stay with my commitment of 3 bags? Jelly rolls are cut by the width of fabric (WOF) and the wof has a stretch to it where as the length of fabric has no or minimal stretch.. some fabrics are stretchier than others.. I just cut some black Kona cotton and had to look twice to make sure I got the right fabric cause it had sooo much stretch to it I thought it had lycra in it..
Well, so far we have 7 including myself.. I hope we have at least 10 participants by the 31st. Hi everyone. I think I have found enough white for these blocks. I was planning to use white on white until I reread the rules. Now only good white it is. Tomorrow I plan picking up another yard or two of Kona white. Suggestion. PM some former people who might like to start up again, now that it is a new year. I made 9 more blocks today...Pics will be posted soon! jlt37869 Has Joined our swap! Welcome!!!!! We now Have 8 ! Yay!! Last edited by Honchey; 01-20-2019 at 08:42 PM. I'm in for 10 sets and also using Kona white. These are exactly the kind of blocks I'd love to make and swap. Unfortunately, I've just found this and have other commitments right now. And, my sewing machine has just started acting up. I'm going to keep an eye on the swap though and hope there's a repeat of the scrappy/white in the future. Looks like fun!